This article is about the Book of Zephaniah. For the Hebrew prophet, see Zephaniah. The Book of Zephaniah (Hebrew: צְפַנְיָה, Modern Tsfanya, Tiberian Ṣəp̄anyā, /ˌzɛfəˈnaɪ.ə/) is the ninth of the twelve minor prophets, preceded by Habakkuk and followed by Haggai. The name Zephaniah means "Yahweh has hidden/protected," "Yahweh hides," or "Yahweh is my secret." 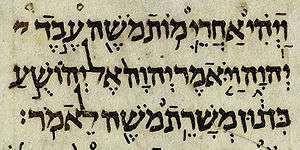 The book's superscription attributes its authorship to "Zephaniah son of Cushi son of Gedaliah son of Amariah son of Hezekiah, in the days of King Josiah son of Amon of Judah" (1:1, NRSV). All that is known of Zephaniah comes from the text. The name "Cushi," Zephaniah’s father, means "Cushite" or "Ethiopian," and the text of Zephaniah mentions the sin and restoration of Ethiopians. While some have concluded from this that Zephaniah was a black Jew, Ehud Ben Zvi maintains that, based on the context, "Cushi" must be understood as a personal name rather than an indicator of nationality. 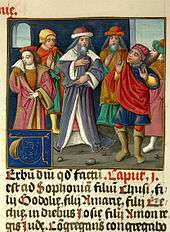 Abraham ibn Ezra interpreted the name Hezekiah in the superscription as King Hezekiah of Judah, though that is not a claim advanced in the text of Zephaniah. As with many of the other prophets, there is no external evidence to directly associate composition of the book with a prophet by the name of Zephaniah. Some scholars, such as Kent Harold Richards and Jason DeRouchie, consider the words in Zephaniah to reflect a time early in the reign of King Josiah (640-609 BCE) before his reforms of 622 BCE took full effect, in which case the prophet may have been born during the reign of Manasseh (698/687-642 BCE). Others agree that some portion of the book is postmonarchic, that is, dating to later than 586 BCE when the Kingdom of Judah fell in the Siege of Jerusalem. Some who consider the book to have largely been written by a historical Zephaniah have suggested that he may have been a disciple of Isaiah because of the two books' similar focus on rampant corruption and injustice in Judah. If Zephaniah was largely composed during the monarchic period, then its composition was occasioned by Judah's refusal to obey its covenant obligations toward Yahweh despite having seen Israel's exile a generation or two previously—an exile that the Judahite literary tradition attributed to Yahweh's anger against Israel's disobedience to his covenant. In this historical context, Zephaniah urges Judah to obedience to Yahweh, saying that "perhaps" he will forgive them if they do. More consistently than any other prophetic book, Zephaniah focuses on "the day of the Lord," developing this tradition from its first appearance in Amos. The day of the Lord tradition also appears in Isaiah, Ezekiel, Obadiah, and Joel. The book begins by describing Yahweh's judgement. The threefold repetition of "I will sweep away" in 1:2-3 emphasizes the totality of the destruction, as the number three often signifies complete perfection in the Bible. The order of creatures in 1:2 ("humans and animals . . . the birds . . . the fish") is the opposite of the creation order in Genesis 1:1-28, signifying an undoing of creation. This is also signified by the way that "from the face of the earth" forms an inclusio around 1:2-3, hearkening back to how the phrase is used in the Genesis flood narrative in Genesis 6:7, 7:4, 8:8, where it also connotes an undoing of creation. As is common in prophetic literature in the Bible, a "remnant" survives Yahweh's judgement in Zephaniah by humbly seeking refuge in Yahweh. The book concludes in an announcement of hope and joy, as Yahweh "bursts forth in joyful divine celebration" over his people. Because of its hopeful tone of the gathering and restoration of exiles, Zephaniah 3:20 has been included in Jewish liturgy. Zephaniah served as a major inspiration for the medieval Catholic hymn "Dies Irae," whose title and opening words are from the Vulgate translation of Zephaniah 1:15-16. 1 2 3 4 5 6 Grudem et al. 2008, p. 1729. 1 2 3 Carson et al. 2015, p. 1839. 1 2 Berlin et al. 2004, p. 1235. ↑ Berlin et al. 2004, pp. 781-784, 918, 1043. 1 2 3 Attridge & Meeks 2006, p. 1259. 1 2 Berlin et al. 2004, p. 2111. ↑ Berlin et al. 2004, p. 1234. ↑ Berlin et al. 2004, pp. 758-759. ↑ Attridge & Meeks 2006, pp. 1260-64. 1 2 Attridge & Meeks 2006, pp. 1259-60. ↑ Berlin et al. 2004, p. 1186. ↑ Berlin et al. 2004, p. 1169. 1 2 Attridge & Meeks 2006, p. 1260. ↑ Berlin et al. 2004, p. 1505. ↑ Grudem et al. 2006, p. 1732. ↑ Berlin et al. 2004, p. 21. ↑ Berlin et al. 2004, p. 1241. ↑ Grudem et al. 2008, p. 1738. 1 2 Berlin et al. 2004, p. 1242. ↑ Grudem et al. 2008, p. 1739. Attridge, Harold W.; Meeks, Wayne A., eds. (2006). The HarperCollins Study Bible (Revised ed.). New York: HarperCollins. ISBN 978-0061228407. Berlin, Adele; Brettler, Marc Zvi; Fishbane, Michael, eds. (2004). The Jewish Study Bible. New York: Oxford University Press. ISBN 978-0195297515. Carson, D. A.; Hess, Richard S.; Alexander, T. D.; Moo, Douglas J.; Naselli, Andrew David, eds. (2015). NIV Zondervan Study Bible. Grand Rapids: Zondervan. ISBN 978-0310438335. Grudem, Wayne; Dennis, Lane T.; Packer, J. I.; Collins, C. John; Schreiner, Thomas R.; Taylor, Justin, eds. (2008). ESV Study Bible. Wheaton: Crossway. ISBN 978-1433502415. Hitchcock, Roswell Dwight (1869). Bible Names Dictionary. Archived from the original on 1 July 2016. Faulhaber, M. (1913). "Sophonias (Zephaniah)". In Herbermann, Charles. Catholic Encyclopedia. New York: Robert Appleton Company. Transcribed by Thomas M. Barrett. 2003. Wikimedia Commons has media related to Book of Zephaniah.